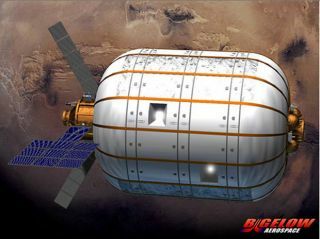 An artist's illustration of a Bigelow Aerospace BA 330 inflatable module with Mars in the background. The BA 330 module is expected to be designed to form part of a multi-module space station, or serve as an independent orbiting outpost. NEW YORK — Space tourism and commercial space mining projects are ushering in a new era of human spaceflight, but their success of private spaceflight will depend on ensuring safety and reducing the cost, experts say. Spaceflight companies such as SpaceX or Space Adventures, Ltd. could make the dream of space travel a reality for some, and may take on the role NASA once had in pushing the frontier of space, a panel of experts said during the 2014 Isaac Asimov Memorial Debate debate here Wednesday (March 19) at the American Museum of Natural History. The 19th-century adventurers Lewis and Clark, for example, weren't the actual people who colonized Montana, said Michael Gold, director of Washington, D.C., operations and business growth for the Bigelow Aerospace, a company that is developing private inflatable space stations. It was the homesteaders, the farmers and the businessmen who followed later. "You can't just go to space like Montana homesteaders and pitch a tent," said Neil deGrasse Tyson, director of the museum's Hayden Planetarium and the host of the new show "Cosmos: A Spacetime Odyssey." Tyson moderated Wednesday night's debate, which had the theme of "Selling Space." In addition to Gold, the panel included several luminaries in human spaceflight, including Wanda Austin, president and CEO of The Aerospace Corporation; John Logsdon, space policy analyst and professor emeritus at George Washington University; Elliot Pulham, CEO of the Space Foundation; Tom Shelley, president of Space Adventures, Ltd. and Robert Walker, former chairman of the House Committee on Science, Space and Technology. Astrophysicist Neil deGrasse Tyson (far left) hosts the 2014 Asimov Memorial Debate, focused on selling private spaceflight, on March 19, 2014 at the American Museum of Natural History in New York City, NY. Like all new forms of travel, private spaceflight carries significant risks. But the panelists said they didn't see the risks as insurmountable. Ultimately, a bad safety record would hurt companies. "There's a perception that commercial space is less safe," Gold said. But "if we have a bad day, we lose everything." But beyond having a good safety record, it's important to understand the risks, Austin said. "It doesn’t matter how safe [a spaceship] has been, it matters what one you're sitting on." Tyson said for him, it's about the reward. He wouldn't accept a 1 percent risk of dying to get to low-Earth orbit, but he might accept a 10 percent risk of dying to be the first person on Mars. The price of space travel is another hurdle facing the fledgling commercial spaceflight industry. Space Adventures, Ltd., caters to space tourists (multimillionaire Dennis Tito was their first customer) by buying space on the Russian Soyuz spacecraft. Right now, the cost of a seat is $52 million. A price tag like that restricts space travel to "the 1 percent of the 1 percent," Tyson said, to which Shelley replied, "you've got to start somewhere." And NASA actually paid more than $52 million per astronaut, other panelists pointed out. The space agency currently pays about $70 million per seat to fly American astronauts on a Russian Soyuz spacecraft, under its latest deal with Russia's Federal Space Agency. Still, it will be a while before a family who goes to Disneyland for vacation can save up enough to go take a vacation in space, Shelley admitted. Tyson later brought up the topic of buying property in space. "I understand you want to sell space on the moon?" he asked Gold. The Outer Space Treaty prevents countries from claiming land in space. But allowing individuals to buy property could be an incentive to go to space, Gold said. "You should be able to enjoy the fruits of your labor." Finally, the panelists made a passing mention of China and other countries with space programs. If China were to put military bases on Mars, Tyson said, the United States would send manned missions there in a heartbeat. After the debate, Tyson and the panelists met with journalists in a roundtable discussion that lasted late into the evening, with discussions ranging from asteroid mining to Tyson reflecting on the success of "Cosmos." So would Tyson himself take the chance to go to space? Absolutely, he told Space.com. But he said would rather take the 100th trip than the first. Follow Tanya Lewis on Twitterand Google+.Follow us @Spacedotcom, Facebook and Google+. Original article on Space.com.